This book opens a new page of neuro-immunobiology providing substantive experimental and clinical data to support current understanding in the field, and potential applications of this knowledge in the treatment of disease. The volume is a collection of complex, new data drawn from multiple areas of investigation in the field. The contents summarize current understanding on the presence and function of CNS cytokines and their receptors in a variety of CNS cells during health and disease. 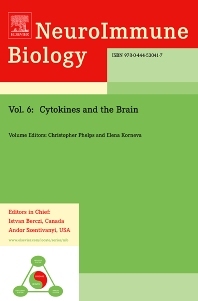 The chapters are a collection of complex, new data demonstrating the presence and synthesis of cytokines in brain cells, as well as their receptors on cell membranes in health and disease. The strength of the volume are the descriptions of the authors own investigations, together with those of others in the field pertaining to a large number of cytokines in brain function, as well as mechanisms involved in the development of CNS disorders, including multiple sclerosis and Alzheimer’s disease. Also included are novel approaches to the treatment of CNS disorders based on new experimental data. The contributors to this volume are internationally known scientists and clinical researchers in their respective fields of investigation and treatment. Immunologists, rheumatologists, endocrinologists, and neuroendocrinologists.